Australia’s best tabla and tabla supplies are now available in Brisbane, as local business Tabla Wala Australia has launched in Oxley. Supplying top quality drums, skins and other accessories from leading Varanasi tabla maker Mohammad Anwar, Tabla Wala Australia’s Shen Flindell has been building the business from the ground up over the last 10 years. While studying the Benares style of classical tabla with his guru Pt Ashutosh Bhattacharya since 1994, Shen also learnt a great deal from Anwar about repairing tabla. 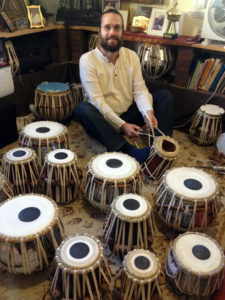 Nowadays many tabla players from Brisbane and around Australia have their tablas repaired by Shen or use his puris, including Dheeraj Shrestha, Ravi Singh, Joseph Nand, and Bobby Singh (Sydney). Visits to Tabla Wala Australia are by appointment only: Contact Shen on 0415106428, email sales@tablawala.com.au, or visit www.tablawala.com.au for further information.